Having the usual Bread toast and sandwiches might be little boring. So to compensate that, why don’t you try having Bread Upma. It can be prepared in a jiffy during mornings when one is running late. It could also be had as an evening snack or naalumani palahaaram. 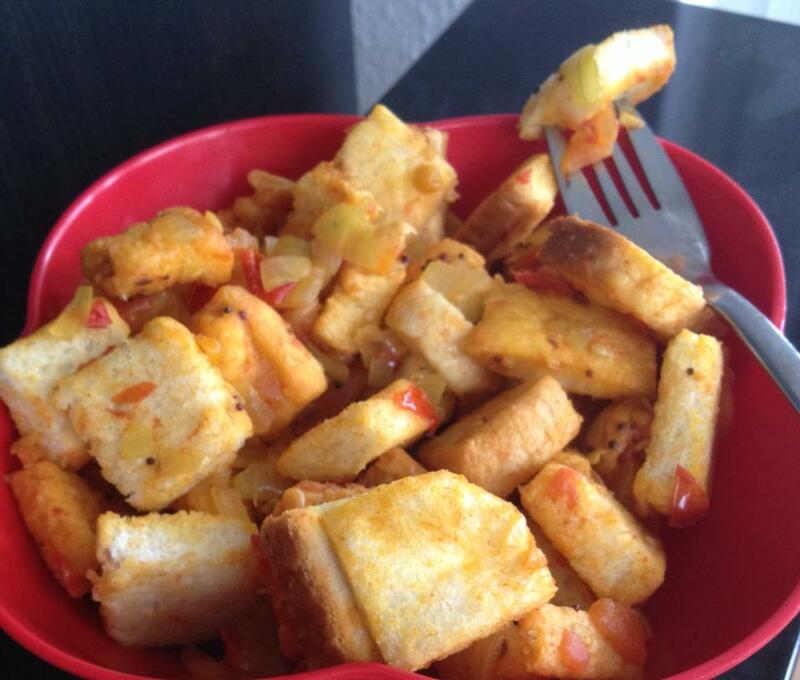 I love bread upma as breakfast or as a snack in the evenings as well. It is tasty, spicy and quite filling too. So here goes the Bread Upma in a typical South Indian Style. Cut the bread slices into small bite sized pieces. In a pan, heat ghee or oil and fry the bread pieces until golden brown. Remove and keep aside. In the same pan, heat oil and season with the items given ‘for seasoning’. Throw in the chopped onions, ginger, slit green chillies and fry till it is translucent. After few minutes, add the chopped tomatoes and cook till it is mushy. Now add a pinch of turmeric powder, sambar powder, salt and stir well. Sprinkle some water if it is way too dry. Add in the fried bread pieces and toss it. Add ghee / coconut oil and cook for few minutes on a low flame until bread pieces absorb the spices. And serve warm. You can eat the bread upma as such. You do not need any side dishes or accompaniments. You can use tomato sauce / ketchup instead of chopped tomatoes. Even ginger – garlic paste could be used. White bread / whole wheat bread / multigrain bread could also be used. Optionally you can add cashews, peanuts or ground nuts to the bread upma. A tsp of lemon juice may also be added just before serving to get that tangy flavor. You can also garnish with coriander leaves and or curry leaves.